I've been busy in the yard. 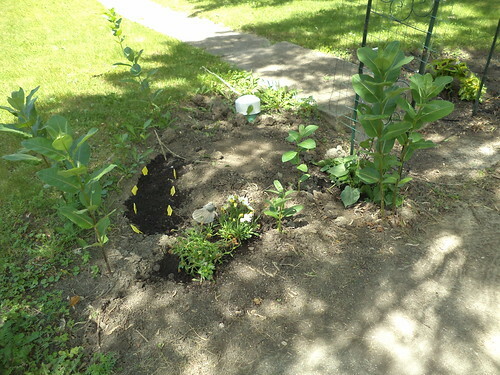 The first thing to do was weed the front beds by the arbor. By the time I got to them, they were weedy but not overgrown. 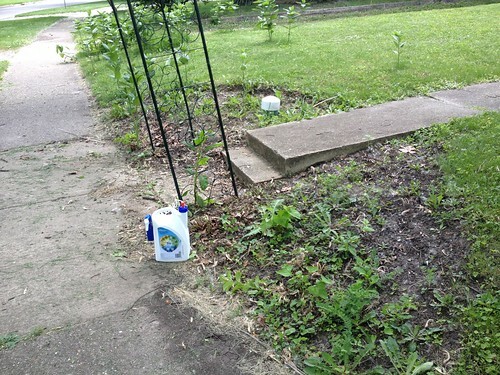 I bought Round-Up to spray on the trees which are in the beds. I don't have the stamina to dig them out, but Round-Up does work, to an extent, to kill them. You just need to be fairly religious about spraying and, in that respect, I'm not. But I can pull weeds because I can sit down while doing that. Along with the weeding, there was planting to be done. Here's the south side of the arbor. The dirt is not very good in these areas. I should have someone rototill mushroom compost into the soil, along with some garden soil in an effort to make these beds better for flowers. 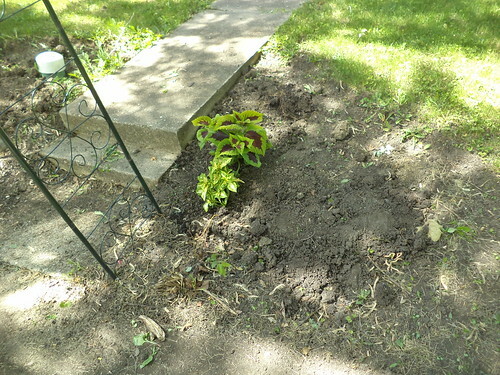 It will, of course, bring long dormant weed seeds to where they can sprout, but I can deal with weeding. Because I don't have anyone who can rototill, my solution is to dig holes in the ground and fill those with a mix of soil and compost. Plants I want out front then go into the holes. On the south side, I have some annual daisies and several morning glories. The black mass in the left center is where I've planted the sunflowers from last year. I have milkweed, of course. It tends to like craptastic soil like this. I was late getting the sunflowers in the ground but they are doing well as of today. This is the north side. Right now, all I have in this bed are a couple of coleus. They are quite distinctive in marking but it looks a little sad on this side. 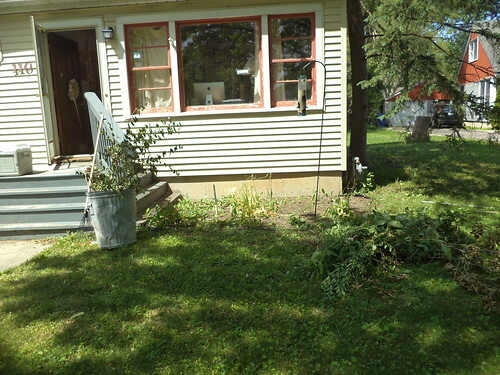 I think, this weekend, after I've paid bills, I will go to the nursery and get a small fern and a hosta for this side. It's 80% shade anyway. I have a marigold plant to replace on the deck, too. Moving to the front of the house, I cleared out the north side, under the picture window. The tube feeder is a huge hit, with finches, sparrows and cardinals all frequenting the perches. I spent time trimming back the lilac and the cherry tree off the right side of the photo. My loppers is not working well anymore. It binds in the joint and generous applications of WD-40 don't seems to be loosening it. Perhaps I should look into the cost of new ones. I need to do the usual weeding but I'm happy with how things have progressed. Best of all, :::cue Frank Sinatra::: I did it my way.